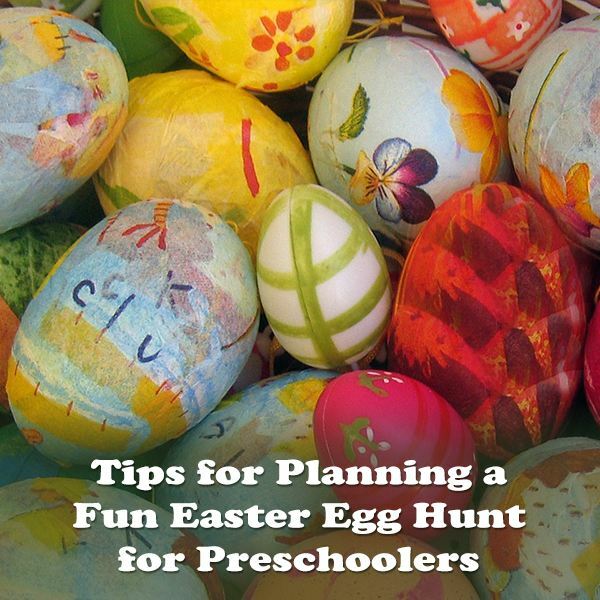 Before turning a preschool Easter egg hunt idea into fun activities for the children, assess available supplies. Are there leftover plastic Easter eggs from previous years or will you incorporate real eggs in this year’s activity? If opting for real eggs, why not also add egg coloring to the day’s activities? What kinds of baskets are available? If the local dollar stores have some great-looking baskets, they might be extra Easter gifts for the kids. If nothing really fits the bill, you can easily make your own. 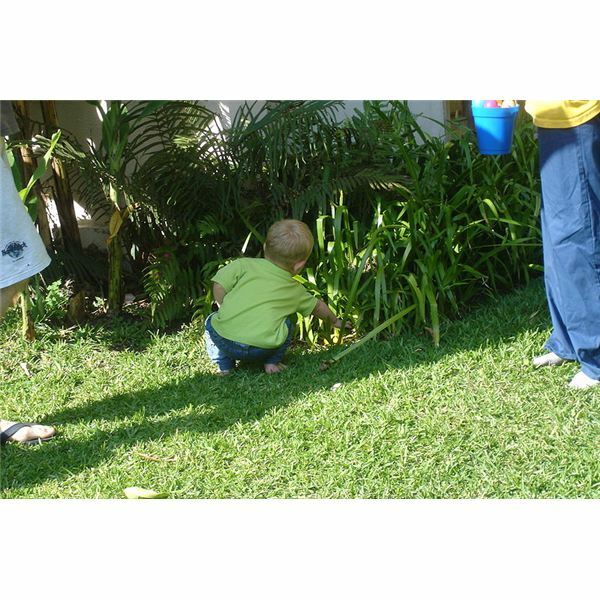 Weather permitting, preschool children will love hunting for eggs outside. Plan a field trip to a nearby park or rope off an area of the schoolyard, so older students will not pick up the eggs intended for the youngsters. Walk through the area – or enlist the help of parent volunteers or classroom helpers — and remove any items that may be dangerous to young children. Examples include bottle caps, cigarette butts and – in park settings – dog feces. Hide the eggs in easy to spot locations. If an outdoor locale is not readily available, try to reserve an empty classroom or perhaps the auditorium or gym. Once again, enlist the help of parents or assistants and move any potential dangers out of the way; these include stacked chairs, unlocked gym equipment and small toys. Decorate the room with a few pastel-colored streamers and hide the eggs. An egg hunt can bring out the tears in less aggressive or more sensitive children. Preschool education professionals may wish to eliminate the competition for eggs by setting a few ground rules. For example, plan on having each child find a limited number, i.e. three eggs each. Instruct the children to stop searching for eggs after they find the third one. When using plastic eggs for the Easter egg hunt, offer the children the opportunity to go to the sidelines and break them open to find the hidden treasures inside. Some teachers may wish to have the fun of the hunt without the sugary side-effects of the candy. There is an acceptable alternative. Hide empty plastic eggs. Assign each egg a numerical value; simply write a number – from one to three – on the inside of each egg. Allow the preschoolers to find their three eggs. At the sidelines, adult helpers assist children in adding up the numbers. Numbers correspond to little prizes; for example, a child who found three eggs (with a numerical value of one each) now has three points. Three points correspond to a prize, such as a dollar store blow-up bunny or 10-piece Easter bunny puzzle. Conversely, children may opt for redeeming their points individually; one point may be good for one Easter pencil or bunny sticker. If the child desires, she may redeem three points for three stickers rather than for one larger prize. If a child hits the jackpot and finds three eggs with a numerical value of three each, he is the grand prize winner. Do not allow too much disparity between one-point and three-point prizes, but allow the grand prize winner to be in charge of leading the “Easter parade" of egg hunters back into the classroom. In school settings where food allergies can turn Easter treats into a danger, this method of prize hunt takes the candy out of the equation but does not at all diminish the fun. Easter is a special day for Christians. Teach its significance without missing out on the fun. Ask the children to each bring in one large plastic egg filled with a drawing of something that represents new life or spring. Children may bring in eggs filled with drawings of caterpillars, spring flowers or baby animals. After each child cracks open a plastic egg and shares with the class about their examples of new life that God is creating and giving, the teacher cracks open her egg and shows it to the children. The egg is empty! Explain that God — for Easter — gave everyone a chance at a new life by taking Jesus Christ home to heaven. Now collect all of the eggs and hide them indoors or outside, as outlined above. Allow the children to go searching and participate in all the springtime fun that kids in the secular preschool setting enjoy.